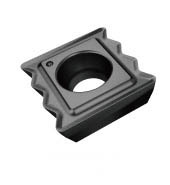 Internal Coolant- standard screw-fit body adapts to almost any kind of the screw-fit tool. holder or extension bar in the market. Max. drilling depth 160 mm. Recommended for Alloy Steel, Steel <30HRC, Steel 30-50HRC, Stainless steel, Hardened steel upto 56 HRC. Adapt to almost any kinds of the screw-fit tool holder or extension bar in the market. For deep hole, recommend Insert NC5074.